If you own a winery or other agricultural business in Monterey County, you face some pretty stiff competition. Odds are that prospective customers have plenty of options, so it’s crucial to find ways to stand out from the crowd. What better way to do so than with a well designed sign? Oftentimes, a company’s sign is the first thing a potential customer has to go on. People routinely make snap judgments about businesses based on their signs alone, so it’s worth it to take your time when searching for a professional sign company that also specializes in design. What makes for an effective agricultural sign, though? The answers may surprise you! The first job of a well-designed sign is to grab people’s attention. If you run an agricultural business, chances are that you rely somewhat heavily on passersby. When people drive past your sign, it needs to call out to them. This can be accomplished in a number of ways, but the attention must come from positive attributes – not negative ones. Crisp, bold lettering, bright, vibrant colors and a nice balance between blank space, graphics and text all play critical roles here. In short, your sign needs to pop out, and it shouldn’t be overshadowed by surrounding elements. If people see your business sign and can’t immediately figure out what kinds of goods and services your company provides, they’re unlikely to act on it. Therefore, your sign must use language effectively to convey information in a brief, concise and compelling way. Don’t beat around the bush. Make it readily apparent what your business has to offer and why your company is the name to trust. Give people what they expect to some degree, but add a surprising twist here and there to stand out. For instance, if you run a winery, definitely include phrases like “wine tastings” and “vineyard tours.” However, throw in a few unique phrases to demonstrate why your winery is superior to all the others. Even if your sign boasts highly effective verbiage and interesting information, it’s not going to do a lot of good without being impressive too. For this to happen, it needs to be of the utmost quality. Achieving this is easier said than done, but a lot of it boils down to the kinds of techniques that are used when creating the sign. For instance, using custom paint, gold leafing, sandblasting and hand-carved features can make a massive difference. These and other thoughtful touches show people that your company is a cut above the rest. It instills a sense of trust in those who view it, which makes them all the more likely to do business with your company. A great sign doesn’t just help you attract new business. It helps you keep people coming back for more. Many who pass through Monterey County for wine tastings and other food-and-drink-related pursuits return again and again. When you have a memorable, recognizable sign, you make it easier for those folks to find your business again in the future. Even if you provide impeccable service and amazing products, people can easily forget the name of your company over time. Well-designed signs boast logos, colors, mottos and graphics that become seared into people’s memories. When they come upon your website or simply drive by again later and recognize your sign, they’re more likely to give you repeat business. At this point, you’re probably feeling overwhelmed at the prospect of designing an effective sign for your Monterey County agricultural business. Don’t be. The right sign company can make short work of it for you, and it’s well worth it to invest in such services. Be sure to do so soon to give your business the competitive edge it needs and deserves. 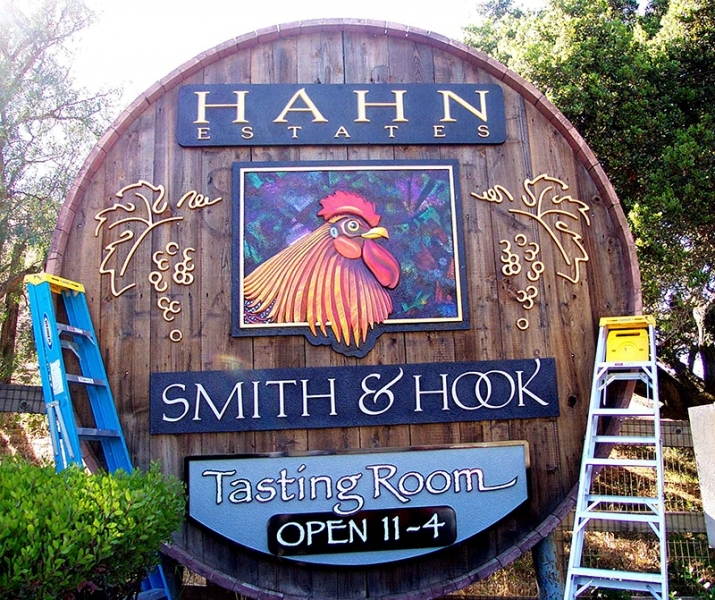 Signs by Van’s signage can be seen all over Coastal Northern California. Our service area is from Monterey/Carmel, to Salinas, Santa Cruz, Paso Robles, Morgan Hill and Hollister. If you want the very best signage made from top-quality, long-lasting materials, check out our portfolio or visit www.signsbyvan.com.